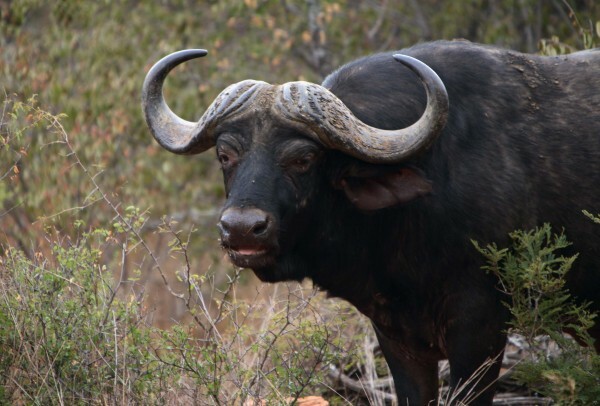 Craig Boddington recently wrote a great article on hunting Cape Buffalo. I’d encourage you to read it. I could not agree more with Craig Boddington. His article “The right buffalo” hits the nail on the head. Although size does matter, so does age and the hunting experience. Personally I put the experience first, age second and the measurement third on my list of priorities. A buffalo hunt is meant to be challenging. Not only should it be difficult, it is also dangerous and that makes it exciting. When the hunter looks at the trophy on his wall years after the hunt, what does he remember? Is it the measurement or is it the thrill of that hunt. It should be the hunt. In South Africa there is some excellent buffalo hunting on extensive properties that have good numbers of buffalo. There are also ranches that “farm” buffalo and produce some magnificent specimens. At the right price, these buffalo can be hunted too… or should I say shot! The trophy collector who is after awards or needs bragging rights, can go and pay to shoot a massive buffalo in a relatively small area where it is fenced in! This isn’t hunting in my books. It’s going to shoot a pre-determined buffalo and the result is guaranteed! This kind of collector probably has no problem shooting from the vehicle either! There is no satisfaction in this type of hunt… it’s like going to a restaurant and choosing your lobster out the tank. Compare that to the hunter who sets out on foot on the fresh tracks of a buffalo early in the morning! He takes in the smells, the sights and sounds of Africa. He has to tune himself into nature, aware of every wind shift and even his own shadow. You have to know the birds, which ones are warning the buffalo like the go away bird, or the oxpeckers that ride on the backs of the buffalo, or just the many birds ringing out their of morning songs. He has to watch his every step, avoiding dry twigs, sharp thorns and at the same time searching for signs of the buffalo. And then so many times, the only sound he hears is the crashing in the bush as the buffalo spook and disappear into the thorns. He can be defeated day after day, returning to camp in the evening sun-burned, scratched and tired – but ready to do it again in the morning. And then one day it comes together. The hunter finds the buffalo grazing unaware of danger, he stalks up successfully, he is fortunate to distinguish a mature bull amongst the herd without being seen… and when this moment arrives his senses are sharp, the adrenalin is pumping and the breathing is unsteady. When he finally gets that clear shot, after days of toil, the memory that lingers years later is not the size of the buffalo but the hunt itself. Those are the memories that a true hunter cherishes and that is what the trophy on the wall should remind him of. Without the thrill of the hunt, without experiencing and absorbing the environment, when the trophy is made too easy to obtain, then the hunter is shortchanged on his African safari.